Planning a Mexican feast for Cinco de Mayo? 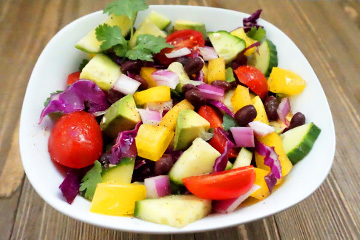 Then this healthy & delicious Fiesta Salad is just what you need to get the party started! It’s so easy to put together; there’s no detailed prepping or cooking. And you can serve this as your main dish, as a dip, with tacos or alongside quinoa rice – the options are endless! 1. Place all the veggies in a large bowl (except the avocado) and toss to combine. 2. Drizzle lime juice and NeoLife Omega-3 Liquid over veggies to make the flavors pop and toss to combine. Then add avocado and toss gently so they don’t get mushy. Taste for salt and pepper, add as needed. 3. Refrigerate for 1 hour. Serve and enjoy! Happy Cinco de Mayo, NeoLifers! For any entrepreneurs out there who have a passion for sharing good health… NeoLife is redefining the world of startups. Put simply, it’s like a tech start-up, but with nutrition. There are low barriers to entry because NeoLife provides the infrastructure that any successful business needs, as well as consumable products, and a compensation plan. So instead of having to raise hundreds of thousands of dollars to get started, it makes entrepreneurship accessible to everyone. You can own your own NeoLife business and it can be passed down as an income-generating asset to future generations. For more information please visit NeoLife.com or call 800.432.5862. To learn how to build a foundation of good nutrition for you and your loved ones, visit ShareNeoLife.com.